Hesperia Lake Camp Grounds was the destination, with nice horse pens, water but no hook ups. 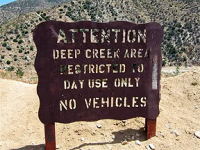 I planned to hike the Deep Creek area and not take Issy since I heard how difficult it was. 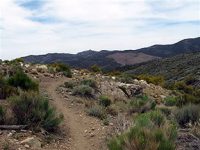 I headed out early, crossed the dam and was into the mountains in a short time finding the PCT on the edge of the Mojave Dam at Deep Creek. This area is treacherous and no one overrated the difficulty of this area, with sheer ledges dropping straight down. The ledges are very narrow and even a hiker would be challenged by the tiny tread. Graffiti fills the rocks there was more non hiker types than anywhere else on the trail so far. I just wanted out of there! I arrived at Big Bear City and was given a tour of the area by my host, Hank. He showed me all the spots where I could access the PCT since I really didn’t want to go back through the same spot where Port had his mishap. I had hoped to be on the trail today but my truck had the alternator and the water pump go out so I had to get it in for repairs. I didn’t want to think what might have happened if it had gone out on the way up to Big Bear. The road was almost straight up from the desert floor and the switch backs were so tight the on coming traffic had to slow to let me pass. It is hard to believe that people travel this every day to get to work. I didn’t even want to think about what they did when it snowed. The mountain air is wonderful, clean and brisk. Such a change from the blowing dry desert. Today the goal was to ride from Big Bear City at Baldwin Lake over to Hwy 18. 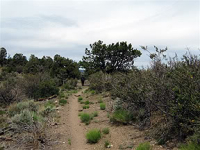 The trail to get to the PCT was 3 plus miles along a ridge behind a subdivision which was horse orientated. The trails fingered all over the mountain and with a hope and a prayer I was able to find my way directly with no rerouting. I felt like I was being led. My host for my trailer and a day of rest is a wonderful fellow who lost his wife 4 months ago to cancer. She was an endurance rider who loved the mountains and did the Tevis Cup and I felt like she was with me on my way to the PCT. Getting back on the PCT was wonderful. Issy took to it like he knew his job and was eager to move forward. He wears Easy Boots as Port did but a size bigger and the same heel problem became apparent after 10 miles or so. The rocks here are sharp and unforgiving with most foot falls landing on them and rolling off to the side. It is going to take some time for Issy’s feet to become conditioned to this type of terrain. Passing through fragrant sections of wild sage and vistas of far reaching mountains I quickly became engrossed in the scenery and we traveled 8 miles in only a few hours. I came to a thru hiker who hopes to get to Canada who said the only water was at Hwy 18 and that was still over a mile further. I decided that since I had to ride back to my trailer I would give Issy my water, head back and keep my fingers crossed that I wouldn’t have any trouble and need it myself. This is never a good option since so much can happen, but I wanted to at least let Issy get a little water. I ended up walking about 6 miles so Issy didn’t have the extra weight and we got to the trailer at 4:30 both exhausted – the elevation here is 7,000’ and I felt the difference. I pulled off Issy’s tack and he hustled to the water trough and then rolled and went about eating hay. It will take me some time to know how he does without water or even feed for that matter. I spent most of my time with Port and only rode Issy enough to keep his condition up. With such a great place to rest every night, both of us were getting spoiled. 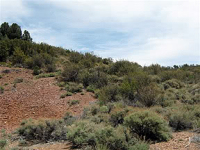 We needed to move on to get back on schedule, so we pulled out of Hank’s early We hoped to have enough time to ride Doble, the site of the old gold mine ruins at Gold Mountain. History has it that over 40 men lost their lives to either hanging or gun battles over the gold and the subsequent claim jumping. Remnants of the gold mine were evident as we passed over the top heading towards Holcomb Valley. Leaving this area we took the trailer back down Hwy 18 and that was as challenging as some of the trails! With a 16 degree grade for 5 miles, I was biting my nails trying to keep my mind on the road and the switchbacks which obscured my vision. I really had no experience driving down a grade that steep. I remembered the fellow who was taking care of our Arkansas farm was a retired long haul truck driver, so I called him for advice.. I reached him only to find out that, after 30 years of truck driving even in California, he never had to deal with a 16 degree grade let alone for 5 miles. He could only offer that I had plenty of truck braking power even if the trailer brakes failed…WHAT?!? I hadn’t even THOUGHT of the trailer brakes failing!. So, down the mountain I went. Within a few minutes of hanging up the phone, the truck AND the trailer both started to smoke!!. Smoke rose everywhere, my brakes went mushy and I felt that I would be lucky if I could quickly find a place to pull off to check out the situation. Finally, with the smell and the smoke horrible, I found a pull-off and inched to the side of the road. I “inched” since the pull off had no guard rails, just an edge and long fall to the valley floor that no one could survive if they rolled over. I got out and saw smoke coming from each tire all the way around. I shuddered at the thought of how I could proceed down the rest of this mountain in such a condition. Issy pressed his head against the grill work of his window, so I opened it completely letting him get some clean fresh air. He looked out and then just went about eating hay as if there wasn’t any problem at all. I got back on the phone and found out that if I would wait an hour or so the brakes would be cool enough to proceed. I honestly didn’t care if I ever moved from that pull off. After an hour I eased out onto the road and headed down. I immediately engaged the trailer brakes, released them to engage the truck brakes and alternated them as we went down, down, down. The trailer brakes held fine, able to slow the truck to a crawl. My confidence elevated a point or two and a long line of locals stacked up behind me. We crept so slow that Issy would have been down the mountain before me if he had been loose. I really didn’t care, I had a system and it was getting us to the bottom safely. We made it to Silverwood Lake without incident. The stay there was relaxing. The state recreation manager opened up the group camp so Issy had his choice of the many pens and ample water supply. There was also some graze for him to nibble on. I needed a ride back to my trailer so that I could move it to the other side of Interstate 15. I soon found a ride with a park worker. I moved the trailer off Swarthout Canyon Road at the advice of the section head for this part of the trail. Although there weren’t any trees the camp was good, and I rode to it crossing under I15, passing under a couple of railroad trestles and crossing railroad tracks winding up on the San Andreas Fault. The terrain reminded me of the sand and gravel one might see seaside or on the ocean bottom. The vastness made Issy explosive even though we had were at the end of a hard ride. Passing through the chaparral, Issy started to pull. I realized he knew the trailer was home since it was only a few miles away. I camped with him in the trailer and think he rested the best since he started. As I was working my way through some ravines I came upon a nice couple walking their dogs. They said they would be happy to host horse people as soon as they got a better source of water. Lack of water is the biggest obstacle for every camp in this general area. If this couple can get some water access, this would be an important layover since there wasn’t anything between there location and I15. All along the trail, the people I have met so far have been generous and kind with offers of help and services. It is hard to understand that these same people moved to remote places like this and are still interested in our journey. We exchanged addresses and parted with hopes of staying in touch. I pushed on hoping Issy would stop working me to death and relax into the ride. He never did! This section of trail was to be the most difficult from a logistic standpoint. I had no way to move my trailer up trail so I had to do day rides out and then back to my trailer meaning double the daily miles. My first day ride was to Guffy Campground where I spent the night and then went back to my trailer. Guffy was a long hard pull all up hill and there wasn’t any water until camp. Issy was an absolute terror pulling and side stepping. He just wasn’t safe to ride on this section of narrow trail. I walked for miles and this only added to Issy’s reserves. At the edge of the Sheep Mountain Wilderness the view of the face of Wright Mountain with it’s mud flow barren slopes was spectacular. It was hard to enjoy the scenery as Issy continued to be a liability and worried me constantly. The 22 miles was exhausting. I didn’t look forward to going back with Issy in full terror mode. I put hobbles on him for the night and fell into my tent not bothering to eat or do anything else. The climb down was a blur with Issy still the same if not worse. I just couldn’t get to my trailer fast enough. I had to make new plans since he was such a liability. I spoke to the section leader in charge of this area. Issy was failing me, with no hope for change in sight. He was a great pack horse over the past few years and never offered to misbehave. Once, his whole pack slipped almost off. Even with it hanging off to one side, he continued to carry it up a tough climb in the Tetons until I could get to him and correct it. I was at a loss to know what was going on now. He acted like an over fit race horse with no mind connection. I decided that, since I didn’t have any ground support for the next 60 miles or so, I would skip to the next section and come back when I had someone at the trailer. Burton is scheduled to join me around the first of July so I just need to be safe until then. 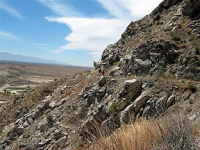 I pulled out and headed north into the Mojave Desert hoping to wear Issy down with the heat. I bypassed some great areas, resenting Issy and yearning for Port .